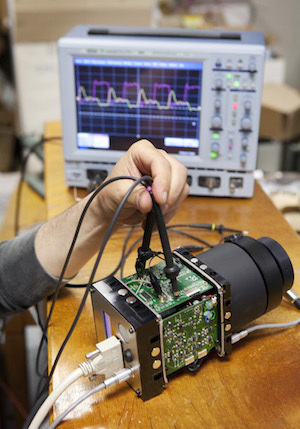 The optical and micro-computing laboratory (LOEMI) develops instruments specific to the work of the IGN both for its production and for its research. It has skills ranging from mechanical design to computer development to optics and electronics. The laboratory’s activities revolve around two main axes: photogrammetry and metrology. Digital Cameras (fr) in strong collaboration with the production departments of the IGN (Service of Air Activities, Service of Image Databases, and the MATIS laboratory), used from 2009 the first version camera (fr), including used until 2008, and the camera version 2 (fr), used from 2009. Stabilized platforms used to support cameras in aircraft.